The San Luis Obispo County Planning Commission has indicated it will approve a scaled-down version of Phillips 66’s proposed rail spur. Commissioners are expected to voted 3-2 in favor of the project at a meeting in September. 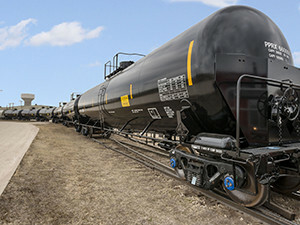 Phillips 66 plans to build a rail spur so that crude oil currently delivered by pipeline could be transported to the Nipomo Mesa refinery by train. The proposed project includes a 6,915-foot rail spur, an unloading facility, on-site pipelines, replacement of coke rail loading tracks and the construction of five parallel tracks with the capacity to hold a 5,190-foot train. Company officials initially proposed five train trips per week to the refinery. Faced with opposition from the public, they scaled down the plan to three trains a week. On Monday, planning commissioners Don Campbell, Jim Harrison and Jim Irving expressed support for the project. Commissioners Eric Meyer and Ken Topping, who serve at the will of supervisors Adam Hill and Bruce Gibson, oppose the rail spur. A motion to reject the project failed on a 3-2 vote. The planning commission has already held several meetings on the rail spur project. Hundreds of people have made public comments, the majority of which have been in opposition to the rail spur. Environmental activists have come from across the state to protest the project. Opponents have stressed the risk of a train derailment and oil spill. Supporters of the rail spur spoke about Phillips 66’s strong safety record and the jobs the refinery provides. Phillips 66 officials say oil production is decreasing in California, and the rail spur would allow the company to bring in crude from new suppliers. Company officials have also said Phillips 66 would deliver the additional oil by truck if the county rejects the rail spur. Still, county staff recommended rejecting the project. Planning staffers said the rail spur could result in oil spills and fires, and the project would generate toxic air emissions that exceed county thresholds. The next hearing on the project is scheduled for Sept. 22. Regardless of how the planning commission rules, the rail spur project is expected to be appealed to the SLO County Board of Supervisors. Let’m rail away. Good jobs, good pay, good taxes, good all around! The following is how the planning commissioners appointed by their respective supervisors voted basically in favor of the project. VERY TELLING IMO. District’s affected – 4, 5 and 1. Ergo the districts most affected voted for the spur. What are the main reasons for approving this project? First, we citizens of SLO County will ultimately consume some of the petroleum that is transported on these trains to the refinery in the Nipomo Mesa. Taking a NIMBY stance is thus simply unfair. Second, if those with the cutsie “oil train” posters in their front yards did some research, they would find that petroleum tankers have long passed through SLO County with little incident. The incremental risk with the addition of the new “oil trains” is infinitesimally small. The “blast zone” fanatics are going to have to find another form of religion once permission is granted. In the interest of public safety, 3rd party inspection and certification of our state wide rails would better serve the public. The debate over truck it or train it is waste of time. The oil company have the choice yet they are willing to do the paperwork as we will continue to demand their resources. Demand safe, not win or loose!